14-18 NOW: Contemporary arts commissions for the First World War centenary presents a detailed look at the extensive 14-18 NOW programme, which was set up to bring a creative response to the centenary of the First World War. The richly illustrated hardback includes an introduction by Margaret MacMillan and essays by David Olusoga, Danny Boyle, Akram Khan, Helen Marriage, Charlotte Higgins, Mark Kermode, William Kentridge and Rachel Whiteread. Spread over five years, 14-18 NOW created a new way of marking major national moments through the arts, commissioning artists to create works that respond to different aspects of the war through film, visual arts, literature, dance, theatre and music. 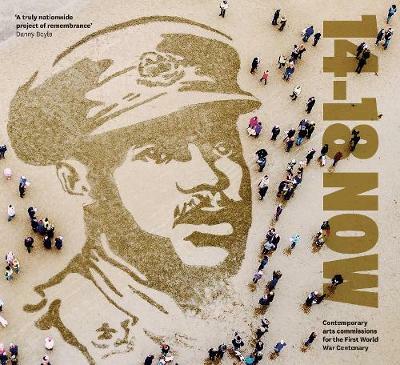 With a vast number of images from the entire season, this fully-illustrated book is a reminder of the transformative power of the arts to bring the stories of the First World War to life, through projects such as Jeremy Deller's Somme tribute We're here because we're here, Peter Jackson's colourised film They Shall Not Grow Old, and Danny Boyle's Armistice beach memorial Pages of the Sea. The 14-18 NOW programme is one of the largest public art commissions of all time, creating over 100 artworks which have been seen by more than 35 million people. Artists include Rachel Whiteread, John Akomfrah, Gillian Wearing, Peter Jackson, Danny Boyle, Vivienne Westwood, Jeremy Deller, Shobana Jeyasingh, Sir Peter Blake, Anna Meredith, William Kentridge, Akram Khan, Susan Philipsz and Yinka Shonibare CBE. Perceptions of the war have been shaped by the artists of the time, including poets, painters, photographers and film-makers - many of whom served and who reflected on the war and its effects. One hundred years later, today's artists are opening up new perspectives on the present as well as the past.